What are you doing to improve your personal productivity? Many business owners I meet have a tough time with feeling and being productive. They feel busy, but they also feel like they aren’t getting the right things done. Part of leading a growing business is making sure you are productive in your day. 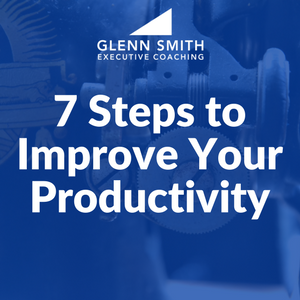 Every business leader, and especially every business owner, needs to be thinking about how they can constantly improve their personal productivity and the productivity of their management and leadership team. This is not going to take a lot of time, in fact, this whole process will only take about 15 minutes. One of my friends actually refers to this as the 15 Magic Minutes every day. So, start by reviewing your projects and goals. Take a big picture look at the things your business has going one. What goals have you set for the next 90 days? What projects are you and your team working on? When you look at your projects and goals, take out or open your calendar, and think about what your priorities are and what things you need to do. What appointments do you have today? This week? Who do you need to meet with? What are other things already on your schedule? If you think of things you need to do in steps #1 and #2, add them to this Master List. I keep this in Microsoft Outlook, you can keep it anywhere. Some people keep it in a journal, others in a Word document or other note-taking app. When things come up that you need to do (no matter the timetable) write it down on this list. This is the power of keeping a Master To-Do list: so these items don’t stay in your head, they get written down. You don’t have to “think” about them anymore because they are stored. Is this task going to take 10 minutes? 30 minutes? An hour? How much time does each task take? Take an estimated guess and then.. I did a blog post a while back that you can look at if you’re not sure what affirmations are. I also did a follow up on how to create affirmations. Every day, review those affirmations, rehearse them, and say them back to yourself. One common question I get is, “When should I do this process?” There is no right or wrong answer. I am a morning person and tend to rise early in the mornings. I read, journal, and do this daily process before the day begins so I can plan properly. Others may do this at night before bed to plan for the next day. The point is, whenever you choose to do it, make it a habit. Put it on your calendar so you know you’ve set time aside to plan. Practice this 7 Step Daily Process, and I promise you will improve your personal productivity. 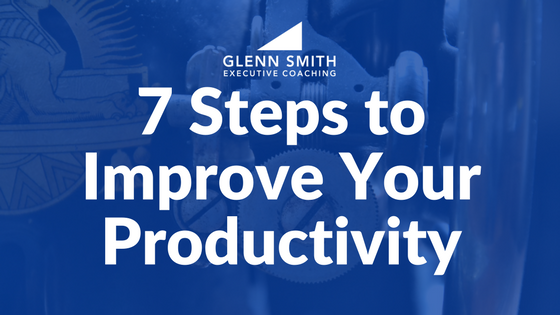 Improve your personal productivity with these 7 steps. Take 15 minutes every day and practice these 7 steps. Your productivity will increase.